What’s the big deal with this Dale DeGroff guy? Someone asked me that awhile back, and I hardly knew where to start. So, here are 10 reasons why you should care that DeGroff’s at the Paris of the Plains Cocktail Festival. 10. He’s the king. Really, when a guy knows so much about cocktails, and is so generous in sharing his expertise, that he earns the title “King Cocktail,” he’s someone you should know. 9. Fresh juice. Mixes out of a gun and canned juices ruled the day when DeGroff took over New York’s newly restored Rainbow Room in 1987. He proved that bars should—and could—use freshly squeezed juice in cocktails. What was then an astounding new trend is now practically mandatory. 8. Joe Baum. This legendary restauranteur hired DeGroff at the Rainbow Room and demanded he recreate a nineteenth century bar stocked only with fresh ingredients. Why’s he on this list? Because Baum also helped design The American Restaurant. 7. DeGroff wrote the book. Literally. His The Craft of the Cocktail is required reading for anyone who owns a cocktail shaker. 5. Pimento Aromatic Bitters. DeGroff makes them, and they’re fantastic, with layers of allspice (or, pimento in Jamaican), anise and other spices. 4. He’s a nice guy. DeGroff has never once refused me an interview. That counts for something, especially when you’re on deadline with articles like this 2007 piece I wrote for the Kansas City Star. 3. Jill DeGroff. I’ve only spoken to Jill once on the phone, but she seems lovely. She’s a self-described “saloon artist” and author of Lush Life: Portraits from the Bar. 2. Beverage Alcohol Resource. He’s a founding partner of BAR, the most gruelling and complete bartender education program around. Survive both it and the United States Bartenders’ Guild Master Accreditation testing program, and you’ve got the mixology and spirits equivalent of a Master of Wine or Master Sommelier certification. 1. Night on the Town. 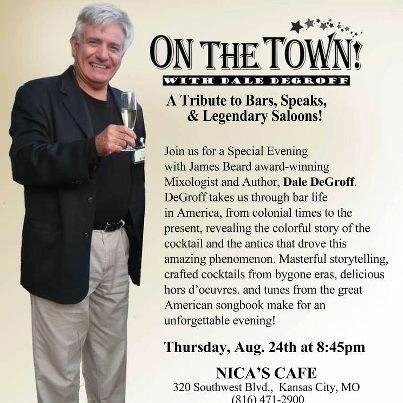 It’s DeGroff’s tribute to the great tradition of American bars, and he’s bringing it to Nica’s Cafe tonight. Buy a ticket. Go. You won’t regret it. In 2007, Ryan Maybee and Doug Frost started a little thing called the Greater Kansas City Bartending Competition. Well, little in comparison to what that event’s grown into—the Paris of the Plains Cocktail Festival. The week-long event’s already underway, and I wrote about it in today’s Kansas City Star (KC’s cocktail culture births Paris of the Plains festival). The main point? That this festival celebrates not just booze, but the city’s heritage and culture. There are dinners and tastings—tequila at Mestizo, Angostura bitters at The Rieger, agave-based spirits at Crayola Café and wine-tales (wine-based cocktails) at The American Restaurant. There’s music—Snuff Jazz, a self-described experimental and improvisational jazz project, will play at Grünauer while Justus Drugstore bartender Chris Conatser serves up Horsefeathers (whiskey and ginger beer). Mark Lowrey and the New Jazz Order will offer a Tanqueray-sponsored Count Basie tribute at the not-quite-opened Kill Devil Club. 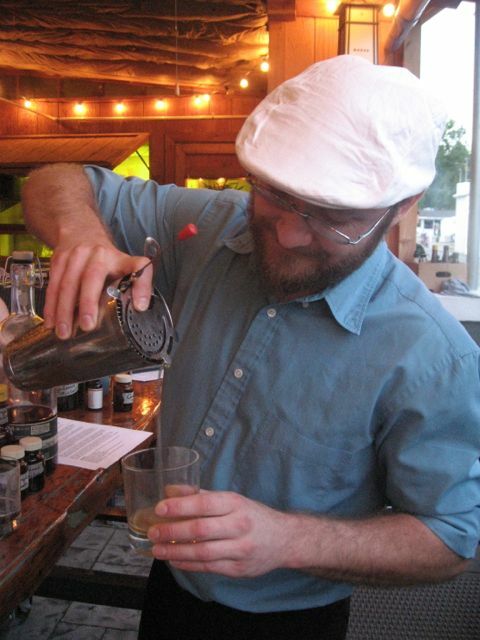 You already missed Chris Conatser’s Monday session on molecular mixology at Justus Drugstore—check out the PoPFest calendar to get in on everything else! There are parties—cocktail competition finalists Berto Santoro, Paige Unger and Conatser cracked open some Barrel Aged Negronis at Extra Virgin last night, but there’s still the Midwest Mohawk Melee. It’s at The Rieger, where mohawked competition finalists Jenn Tosatto, the bar’s manager, and Matt Seiter, bar manager of Sanctuaria in St. Louis, will duke it out. KC Magazine’s also hosting it’s “Best of KC” awards at The Gallery with sponsor Dark Horse Distillery on Saturday night. There’s philanthropy—KCPT is the beneficiary of the PoPFest Gala on Monday. It’s not just any gala, though. Attendees will also get to judge the final round of the Washington Cup, the only competition exclusively for American-made spirits and liqueurs. 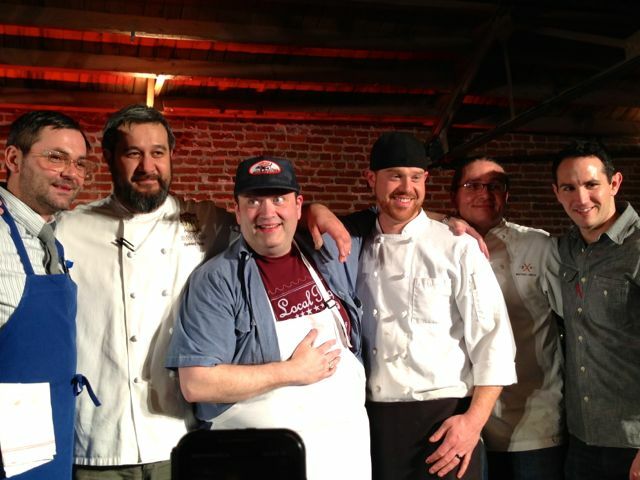 And of course there’s the Paris of the Plains Bartending Competition on Sunday, when a dozen finalists including both familiar KC faces and bartenders from Colorado, Illinois, Pennsylvania and Oklahoma will take the stage at The Uptown. Life’s good these days, but it’s left me precious little time for blogging. Maybe you noticed? No? I’m not surprised. Your life is probably more hectic than mine. As soon as school let out, the pace picked up—swimming lessons, summer theater, preparing for the 4H fair, family reunions, attempting to keep at least the fruit trees, roses and other trees and shrubs alive during this searing heat…and suddenly it’s time to pack up and head to New Orleans for Tales of the Cocktail. I have managed a little work in between it all. I wrote about the wonderful people at Dark Horse Distillery for the Kansas City Star (New Laws Spur a Generation of New Microdistilleries), and I’m working on a big piece about the Paris of the Plains Cocktail Festival for the same paper. 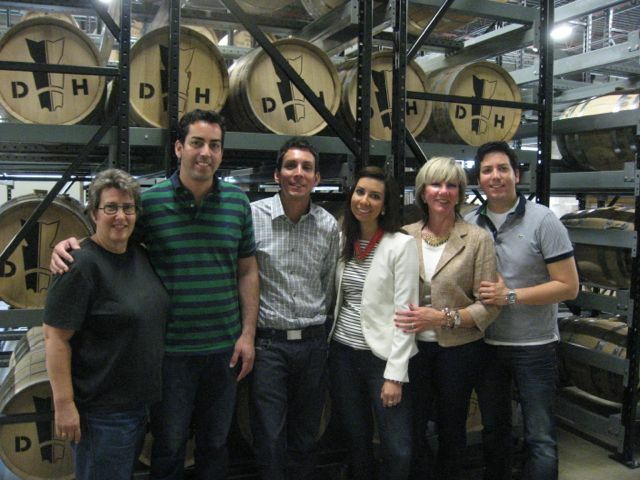 The folks behind Lenexa’s fabulous Dark Horse Distillery (from left): Kris Hennessy, Patrick Garcia, Damian Garcia, Mary Garcia, Jeanne Garcia and Eric Garcia. There have also been a few restaurant profiles for 913, a Johnson County news magazine, and features for Lawrence Business Magazine.And I keep eying the stack of cocktail books on my office floor, thinking I really should get around to reading them. Which is why I was happy to stumble across a book review by Wayne Curtis (What Goes Well with a Martini) in this weekend’s Wall Street Journal. If you like his writing as much as I do, then it’s well worth tracking him down at The Atlantic for his most recent column on Cognac’s identity crisis. Or go old school by picking up a copy of And a Bottle of Rum, perhaps one of the best rum books ever written. That should keep you busy ’til I get back to blogging. Lavender is one of my favorite flowers, but I can never quite decide what to do with it. Dry it and use it in a lamb rub? Or sew it into sachets, like my friends at Washington Creek Lavender do? But it’s so lovely fresh. This year, the scent sent me to my cocktail books, and there I discovered lavender lemonade. The below recipe comes from How to Make Your Own Drinks, and it’s especially fun to make with kids. They can pick the lavender, squeeze the lemons (maybe) and ooh and ahh when adding lemon juice to the lavender syrup turns it pink. Since we also had some grown-ups in the crowd, so I also shook it with Dark Horse Distillery’s Long Shot white whiskey for one of the best cocktails I’ve had all summer. You can also infuse vodka with lavender (another idea from How to Make Your Own Drinks), or use it to flavor simple syrup. That syrup can then go into a mojito (an idea from Market-Fresh Mixology), Saveur magazine’s lavender-lemon fizz or Imbibe’s Provençal martini. 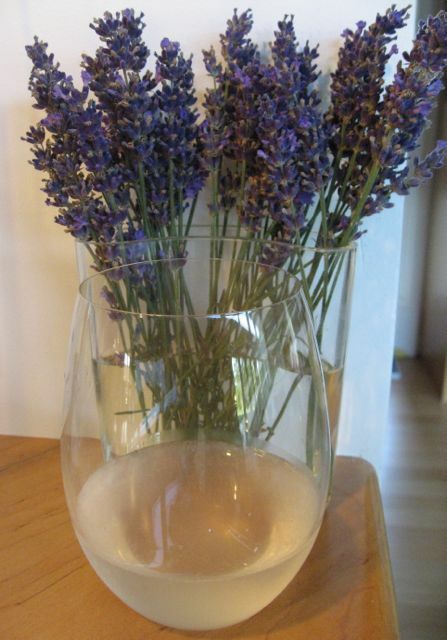 Lavender lemonade: pick a small bunch of fresh lavender and shake to remove any insects. Put the flower heads in a sauce pan and pour about 2-1/4 cups boiling water over them. Put sauce pan on the stove and bring mixture to a boil; simmer for a minute or two. Turn off the heat and leave for 10 minutes to steep. Strain (I used a cheesecloth-lined strainer). Add about 5-1/2 ounces (about 3/4 cup) granulated sugar and stir to dissolve. Add 5 cups cold water. Squeeze 5 lemons and add juice to the pan (this is when it turns pink). Strain again, if needed. Taste to see how concentrated the flavor is; add more sugar or water to taste. To make a lavender lemonade cocktail: Combine 3 ounces lavender lemonade and 1 ounce Long Shot white whiskey to a mixing glass. Fill partway with ice, and then shake. Strain into a cocktail glass. Garnish with a lavender sprig.